MedWise Insurance Advocacy specializes in assisting elder law and personal injury attorneys with complicated medical bills, explanations of benefits, auditing & analyzing medical claims and liens, denied insurance claims, medical letters of appeal and more. We deliver these healthcare-related financial solutions to attorneys throughout the quad-state area of New York, New Jersey, Connecticut and Pennsylvania and beyond, to serve lawyers nationwide who are assisting clients with health insurance claims. As licensed insurance brokers and insurance consultants, we are experts at medical insurance auditing and analyzing medical fees on health insurance claims, and evaluate Medicare, Medicaid, and private health insurance claims, medical bills, and liens. 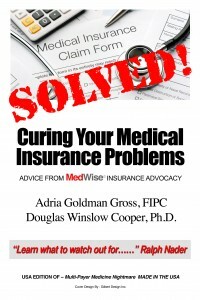 MedWise Insurance Advocacy will also examine all medical claim forms and medical bills for proper coding to ensure patients are receiving the reimbursements they deserve. Improve productivity within your practice by keeping your staff focused on its core responsibilities. Verify whether medical fees are overcharged and/or injury related. Save time analyzing your client’s medical bills and explanations of benefits. Free up your schedule and boost your income. Avoid being accountable for hiring, training, and managing additional employees to handle health insurance matters. Expedite your clients’ medical bill errors, denied claims, and pre-authorizations. When you retain the services of MedWise Insurance Advocacy, you’ll be able to concentrate on what you do best for your clients, while we apply our expertise to health insurance matters. Simply provide us with your client’s medical bills and we’ll do the rest. We promptly contact the insurers and medical providers on your behalf, reducing the stress and workload on you and your staff. The grown daughter of a senior citizen contacted an elder law attorney after seeing her mother’s enormous medical bills following two hospitalizations and stays in rehabilitation centers. The bills—from 13 different healthcare providers—totaled $100,000. Due to the overwhelming paperwork, the daughter did not have the time to go through all of them properly to track what her mother truly owed, and turned to the elder law attorney for advice. The attorney called Adria Gross for help sorting through all the medical bills and ascertaining the family’s true out-of-pocket medical costs. Ms. Gross contacted each of the 13 healthcare providers and facilities and negotiated the bills with all of them. She worked out payment terms with each provider that allowed the client to pay a reduced amount on some; on others, Ms. Gross discovered where Medicare coverage should have been extended and she negotiated coverage as well as discounts. In the end, the patient wound up having to pay only $2000 out of the original $100,000. Could you use the expert assistance of a medical claims consultant and medical insurance advocate? Click here to schedule a free consultation.